Some 500,000 children in England may be at risk of developing life-threatening liver disease because they are overweight, a health adviser has said. Professor Martin Lombard, England's National Clinical Director for Liver Disease, says the four to 14-year-olds could develop "fatty liver disease". Too much fat in liver cells stops the liver from working properly, increasing the risk of heart attack and stroke. It can also lead to diabetes and cirrhosis of the liver later in life. Cirrhosis - scarring of the liver - is commonly associated with alcohol abuse, but it can also be caused by obesity. Professor Lombard bases his projections on figures from the National Child Measurement Programme. He warns that up to 60,000 10 year olds "could be at risk" of having excessive fat in the liver while they are children, leading to serious health problems when they get older. When looking at a broader age range, children aged four to 14, the figures are even more stark, with Professor Lombard estimating that 500,000 are potentially at risk. While the rate of increase in childhood obesity seems to be flattening out, the total number of overweight children is still very high. Government figures for child obesity in England in the school year 2009/10 showed that nearly a fifth of children in reception class (aged four) were obese or overweight. Media captionProfessor Martin Lombard: "The biggest risk factor is being overweight"
Among Year 6 children (10 to 11-year-olds) the figure was one in three. Professor Lombard warns that "non-alcoholic fatty liver disease" could be a silent killer among this generation of children. "The unfortunate problem with liver disease is you don't get any symptoms at all until it's at an advanced stage. So you get cirrhosis and then you have complications that arise from that cirrhosis which can be very serious. "So it's not until that late stage that you get any symptoms at all. 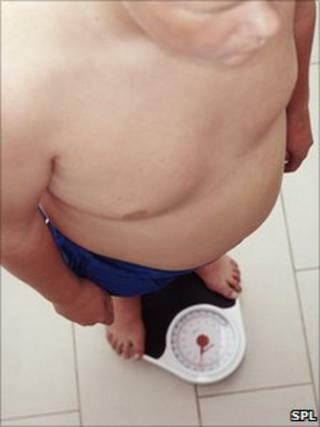 "Parents should be concerned about children who are overweight as they will be at risk of developing fatty liver. "If they don't become more active and lose the weight as they go on, then they become overweight adults and have a range of other risk factors as well." Sarah Matthews, spokesperson of the British Liver Trust, said: "Children's livers are being cultivated for disease by a poor diet and lack of exercise. "Even though alcohol is regarded as the key cause of liver disease in the UK, weight-related liver damage is set to become a huge public health problem where, if the projections hold true, obesity could overtake alcohol as the biggest single driver of cirrhosis in the future. "Too much alcohol and fatty foods, coupled with a lack of symptoms, means that liver disease is becoming difficult to ignore and is already costing the NHS millions each year. Children's livers are being cultivated for disease by a poor diet and lack of exercise. "The number of people affected by liver disease and the health costs are set to soar, particularly with the growing number of young people who are overweight and obese." Tam Fry, from the National Obesity Forum, said concern about obesity had to focus more on its internal consequences. "One of the real terrible things about this particular condition [liver disease] - and other conditions which are internal - is that you can see obesity from the outside but you can't see it from the inside," she said. "What you have to understand is that the fat that you're ingesting not only clogs around the arteries and the organs but also infiltrates them as well. And that is the killer."